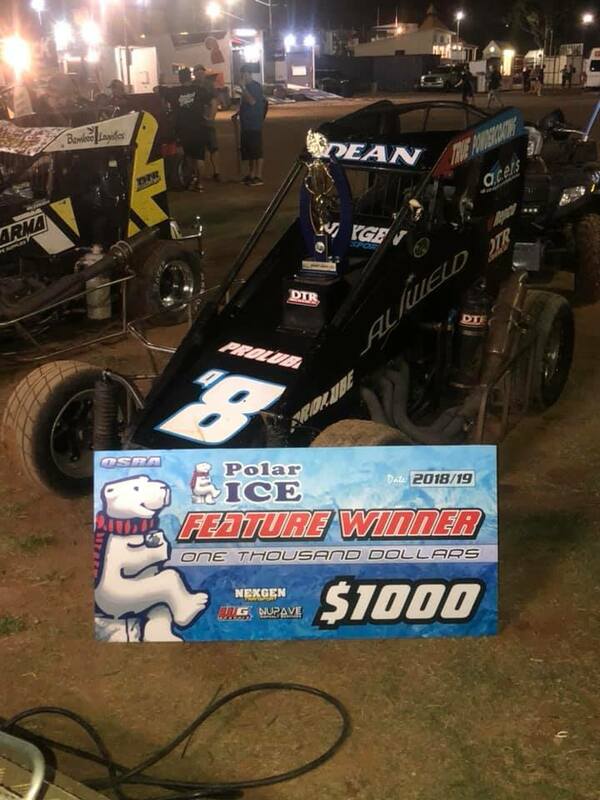 Brock Dean in his Aliweld/DTR Mechanical King Hawk 8Q parked the brand-new Justin Insley Chassis car in victory lane on Saturday night after an action-packed round 8 in the Polar Ice Midget Series at Archerfield. 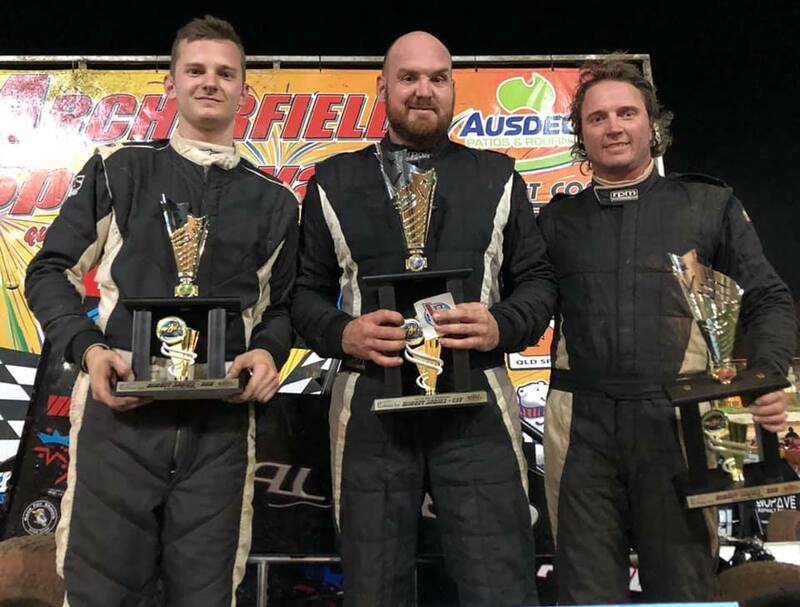 Dean held off a late race charge from the nights Quicktimer Rusty Whittaker and Cal Whatmore Jnr who joined Brock on the podium after the shortened feature event. 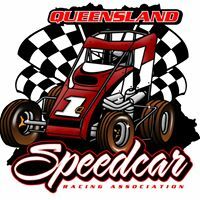 It was on from the get go on what was a super heavy track both Nathan Mathers and Audie Malt finding the turn three wall hard ending what turned out to be a hot lap session as the field was reverted to a draw and invert format. Darren Vine and Brad Dawson became entangled leading up to record lap one in the first heat which resulted in both cars freight training into the wall on the back straight, Vine coming of worse for wear and taking a ride on the tilt tray as Dawson was able to continue Lachy Paulger and the first of our NSW visitors had a quick meeting mid turn one and two which put both the 26N and 37Q cars out as the field resumed at a frantic pace with just three laps done the 89Q car of Whittaker headed infield with an electrical gremlin and Tim Farrell went on to take the victory over Charlie Brown and Whatmore JNR ahead of Scotty Doyle in 4th Brad Dawson and Audie Malt as Nick McDowell crossed in 7th. Heat two was also the departure of the evening for “The Captain” Chris Singleton after brushing the right rear of the 18Q Mathers car this sent the 26Q Spike hard into the turn three wall and as a result Singo’s night was done. The first on the 89er boys to take a heat win on the night was Scotty Doyle in the 89A BOSS Chassis Australia car in a text book race ahead of heat two winner Brock Dean, Cal Whatmore JNR, Tim Farrell, Dan Biner, Riki Harrison and Nathan Mathers finished in 7th as Lachy Paulger retired after 4 laps of the circuit. The nights final heat saw the other 89er in the brigade and that was Rusty Whittaker take the win however only just as the field were counting down the laps the car seemed to develop the same problem that plagued the car in the first heat however hanging on for the win and the points the guys sorted it once and for all for the feature event Mitchell Rooke came home in 2nd ahead of Vine, Brown, Dawson, Clauss and Jamie Hall all on the lead lap and Nick McDowell went one down and Glenn Wright recorded zero laps run. By now Dawson and Brown were also having their own ding dong battle at times most running three wide at pace , Dean continued to set sail with 13 laps to run he had a comfortable lead as the rest of the field were racing hard and fast, Riki Harrison brought on the next yellow bouncing the 67Q high in turn four coming to a stop and again it was Brock Dean faultless in leading the field away from Farrell Whatmore JNR Doyle and Whittaker. Just one lap later Charlie Brown was seen on the tail of the field after a spin in turn one another restart and this time Vine and Farrell we duking it out for track placings as Clauss and Hall brought on yet another yellow it was just one lap later Farrell and Vine came together in turn four as Farrell gingerly tipped the 51Q on its side Vine and Doyle were parked on track avoiding the United Waste car which resulted in them taking up the seats at the back of the bus for the run home. Dean continued to lead however Whittaker was now barking at the heals of the 8Q along with Whatmore and Dawson in 4th as the laps counted down Wright had a meeting with Rooke trying to execute an inside pass for 5th in turn three which would ultimately see the 46Q upside down and the 3Q with extensive exhaust damage the race was declared on a time basis as Dean took the 8Q to victory lane followed by Whittaker and Whatmore JNR. Our next outing for racing will be back at Archerfield on the 9th of March with most guys looking to compete in the UCS round in both Sydney on the 23rd and Toowoomba on the 2nd. We will be having a club meeting at the Vintage Speedcar Club Rooms on Tuesday the 19th of February and all are welcome to attend from 7pm sharp. Tim Farrell in the United Waste Services Eagle/Eagle 51Q banked the nights “QuickTime” $100 cash thanks to Nupave and Nexgen clocking in a 15.457 in the 3rd session of the night he would then go onto a 3rd and an 6th in the nights heats taking him to P9 for the main event eventually crossing in the same spot after the 20. Another rising star to shine was Tom Clauss also with an Eagle/Eagle combination in the TPC Earthmoving/Springfield Lakes Panel and Paint 45Q car, Clauss recorded a 15.536 also in the 3rd session going onto a heat win and a 4th and slotting into P4 on the grid for the feature event. 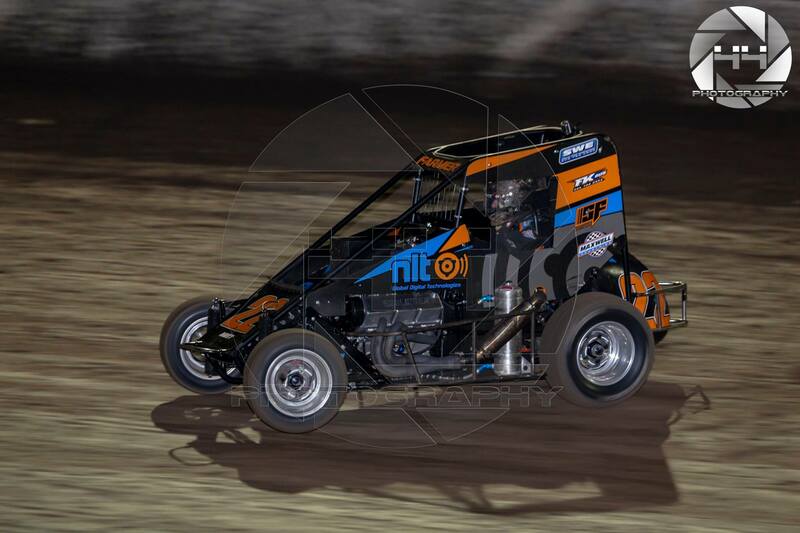 The nights 3rd quickest time on the monitors was set by Rusty Whittaker in the Polar Ice/BOSS Chassis Esslinger 89Q and was the last of the cars in the “15’s” on the heavy surface, Rusty running in a 15.965 then going onto a DNF in heat one and a 2nd in his final saw him way back in the pack “fresh outta P12” however able to make the podium after the duration in 2nd. The night’s eventual round winner ran a 16.034 in the hot lap session backed up with a 4th and a heat win taking the Mike Vine Turbo’s 6Q Spike/Esslinger to P3 for the feature and parking it in victory lane was Darren Vine. Another Eagle chassis car lurking in the background laying down some super tidy laps all night was the 18Q Eagle/Esslinger of Nathan Mathers, Nathan punched out a 16.104 in the hot laps group 3 session followed up with a 6th then a 5th taking the Inksane Tattoo Studio car to P11 for the big and working up to 8th at the chequered. 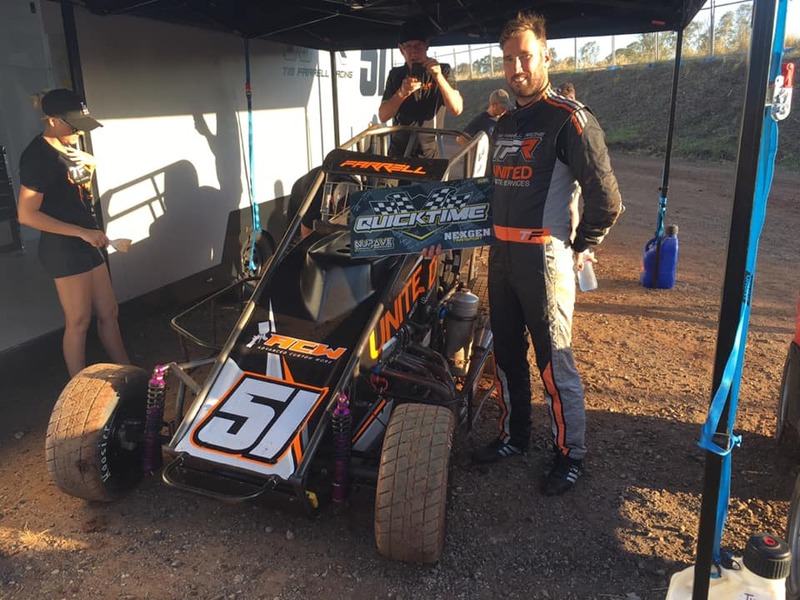 Our only NSW hot shoe this week was Mitch Brien in the 63N Tumbi Tyres and More/C.A.R.S Spike/Hawk, Mitch ran in a 16.183 in the nights second group with a 3rd place and heat win which would ultimately see him P1 in round 7 of the Polar Ice Midget Series and making the podium on his series debut in 3rd. The new kid on the block continues to impress and that’s Ricky Robinson in the 56Q Breka/Gaerte with a solid run in hot laps locking in a 16.251 and 7th quickest then sticking with the trend he went onto a pair of 7th’s in the heat race events then starting “lucky” 13th in the show finishing in 11th. The pilot of the 27Q Spike/Gaerte Audie Malt blasted into 8th with a 16.301 then backing up with a 6th and an 8th in his heats which took the team to P14 in the main event and made the top 10 in 10th place respectfully. 9th in the session saw the Nexgen Hire/Pimpama Landscape Supplies Aggressor of Glenn Wright on the boards running in a 16.303, Glenn then wheeling the 46Q to a heat win and a 3rd being tied on points after the heats were all done and run however with the 63N car of Brien recording the quicker hot lap session time Wright was relegated to P2 in the show however unfortunately whilst battling at the pointy end was forced to park the rocket ship infield with just 5 to go. Rodney Singleton Racing’s Mitchell Rooke rounded out the top 10 in hot laps with a 16.447 in the 3Q Spike/Esslinger, Rooke then going onto a 5th and a DNS which would see the youngster at the back of the bus for the main event however the racer was unable to take the green upon firing up and parked the car infield. Scotty Doyle running the John Williams Auto Sales/BOSS Esslinger 89A was next to rattle to timing boards with a 16.635 , then in the 10 lap heats he went onto a pair of 5th and then P10 for the feature having a great clean run crossing in 6th at the black and white. “The Bandit” Brad Dawson rolled out the first of the “17’s” in the nights very first session with a 17.260 in his GSA Advanced Machining/United Waste Services 81Q Spike/Eagle, Dawson then going onto 2nd in his first heat and a 4th in his final slotting into 5th on the gird, scoring the Revolution Racegear Sunshine Coast “Lucky 4th” place at the flag fall. Cal Whatmore JNR recorded the nights 13th quickest in the Prolube/Speedy Air Conditioning Spike/Gaerte 36Q then with a 4th and a 3rd in the heats parked into P6 for the feature show however parking infield with 11 laps on the board. The Nupave/Platinum Towing 67Q King/Mopar of Riki Harrison tucked into P14 on the times with a 17.573 then backing with a 7th and a 2nd in the 10 lappers he occupied P8 for the show however like Whatmore was seen infield before the duration was done. “Captain” Chris Singleton rounded out the field for the hot laps on what was a super heavy track in the 26Q SSB Batteries/Northcoast Constructions Spike/Esslinger he then backed it up with a 2nd in his first heat race and a 6th in his final transferring those points into P7 for the main show, Singo holding his own finishing in the same spot of 7th. The times in these groups certainly don’t show the capabilities of these cars as they were on what was a super heavy track however all managed to stay off the tilt tray of shame and making stars of themselves for all the wrong reasons. The night’s highlights would go out to Tim Farrell for his first official Nexgen/Nupave QuickTime Award along with Tom Clauss in second and The Bandit just missing the podium in 4th. 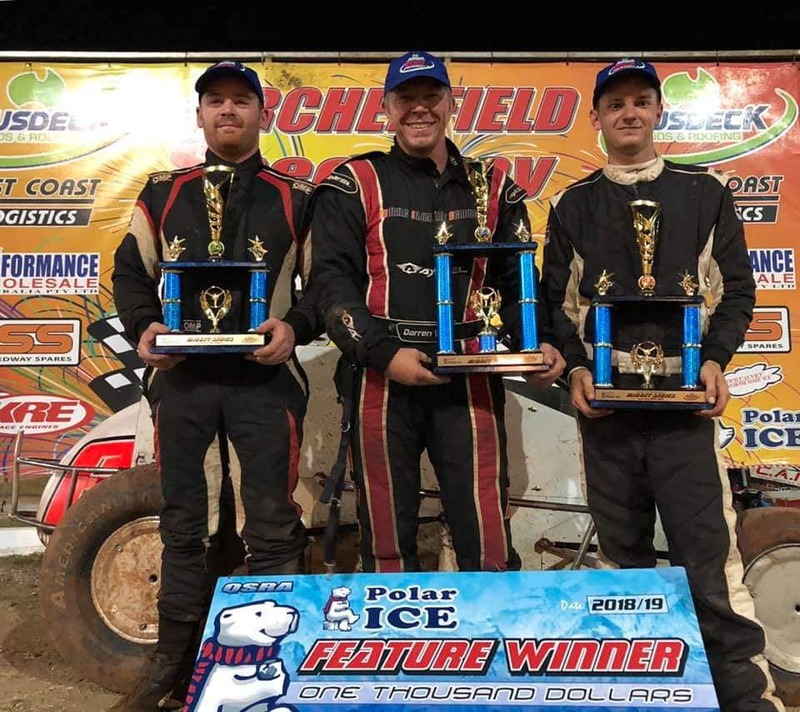 Huge thanks to Mitch Brien and his guys for making the trek north after running the Queensland Title recently representing the NSW Speedcar Club and making the podium on debut in the Polar Ice Series! Mega Thanks to Jack Berry and Polar Ice , NexGen , Nupave , Bob Baker and Revolution Racegear Sunshine Coast for the support!! Our next show we head up the hill to Toowoomba! This coming Saturday the 2nd of February is a QSRA Club Show to crown a “Midget King of the Ring”!! 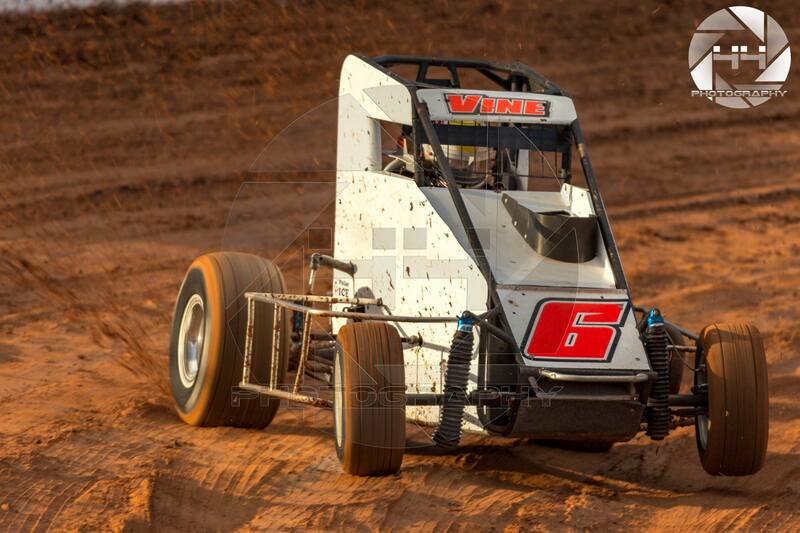 Tonight’s Nexgen/Nupave QuickTime man …… Tim Farrell !!!!! This coming Sunday race fans we are at it again !! We are back to a racer right rear rule and $50 nomination …. don’t forget log books will be collected by Dave at the start of the night but it’s your responsibility to get them before you head home. Putting on an absolute clinic of a drive from buried deep in the pack in grid 10 Darren Vine stormed to the lead at the half way point of the Stan Burrow Stampede last night and set sail to the chequered leading home the BOSS 89Q of Rusty Whittaker and Glen Wright in the 46Q Aggressor third. Vine again topped the timing board in what turned out to be a hot lap session with the draw and invert format being used, Vines 15.892 edged out “Mr Fahrenheit” Glenn Wright who was running red hot with a 16.146 and youngster Bodie Smith running a 16.271 to round out the quick 3. Newly crowned Father Riki Harrison in the Nupave 67Q King wasn’t only the fastest on track in the second heat but showed the field how to get to the chequers hitting some perfect lines lap after lap, Tom Clauss and Glenn Wright battled for the bridesmaid honours while Audie Malt, Nathan Mathers, “Uncle” Brad Harrison all fought for track supremacy in front of Michael Harders and DJ Raw who crossed in 8th. Scott Doyle was a DNS with a left rear tire deciding to part ways with its key ingredient ….. Air, Corey Stothard was another who parked his ride on the grass without completing a revolution. Mitchell Rooke led the programme’s third race from flag to flag in the Singleton Racing 3Q however he was run down to the wire from a hard charging Rusty Whittaker who clocked a 99.578 kph in the BOSS Chassis Australia 89Q machine, Glenn Wright backed up his first heat performance with another third at the flag fall ahead of Brad Harrison, Bodie Smith, DJ Raw, Riki Harrison, Cal Whatmore and “The Tattoo Artist” Nathan Mathers rounding out the 9 car field. The night’s final heat in the round would see a major carpark in turns 3 and 4 with half the field eliminated from the 8 lap event. Corey Stothard was again infield without a lap on the board however it was lap one that saw the Foreman Racing car with Michael Harders at the wheel the only car out of the four still on “all fours” , it appeared as the 20Q machine turned down to a line the 81Q car of Dawson was traveling a lot quicker and collected the left front and as they say the rest is now history , after a series of violent flips and twists the cars of Dawson , Clauss and Malt were all left in the turtle position on the dirt and all sustained enough damage to keep a few crews busy in the lead up to the main event. It was at this stage the 56Q car of Ricky Robinson wouldn’t refire for the restart so along with the 4 cars in the wreck he was also recorded as a DNF. Darren Vine as mentioned had a minor timing issue that the team along with Esslinger Guru Craig Thompson had sorted and it was now Viney portraying the pied piper bringing the rather shortened field home ahead of Scott Doyle Charlie Brown , Jack Bell and Gavin McDowell who were all able to avoid the first lap incident. After the 4 races we saw Mitchell Rooke the highest point’s scorer and would lead the field away with Bodie Smith out of P2, Whittaker and Wright filled row two, Riki Harrison and Charlie Brown were next from the third row, Bradley Harrison and Jack Bell banked enough heat race points to go from P7 and 8 respectfully McDowell and Vine locked into 9 and 10 , Doyle and a nearly fully rebuild 81Q of Dawson secured 11th and 12th , Whatmore JNR and another amazing effort by the 45Q Clauss guys had Tom take the track in 14th, DJ Raw and Mathers bolted into grids 15 and 16, Audie Malt and Ricky Robinson rounded out the field as Corey Stothard parked the 44Q infield. The field were fired up along with the blue 8Q VW driven by Stan back in 79 now owned by Brian Spann after a few roll around laps Rooke brought the field to the green after Whittaker slotted in behind him for second the rest of the field jostled for track space Charlie Brown looped the Repco 11Q in turn one bringing on a yellow and a push truck after lap 5 Cal Whatmore was the first retiree heading infield by this time both the Harrisons were on rails along with Vine as Doyle and Bell were finding their feet as Vine hit the lead Tom Clauss pulled out on lap 11 with what looked like something not quite right in the rear of the 45Q. Just one lap later DJ Raw headed infield with 12 on the board Mitchell Rooke headed infield in the Singleton machine leaving the final 7 laps to be duked out by what was now the parings of Vine and Whittaker and Doyle and Wright all battling it out as Brad Harrison was sitting back a little just waiting to pounce should any of the top 4 get it wrong Bodie Smith looped and parked the 77 mid turns 1 and 2 and was heading infield with 5 remaining we also saw the 81Q Dawson car was now parked on the pit straight entering turn 3 and like the Clauss car looking rather sad in the rear end department. On the final restart the Whittaker 89Q was now barking at the heels of the Vine Spike however cool claim and collected the pair crossed in that order as Doyle and Wright continued to battle it out and we saw it was Wright who got the upper hand after the 20 with Doyle shuffled back to 5th because waiting in the wings was Brad Harrison for 4th, Brown Riki Harrison and Jack Bell rounded out the top 8 Nathan Mathers, Malt, Robinson and McDowell were the final finishers. The night’s highlights this round are Jack C Bell running the 82 Breka who ran some superb laps and finishing in the top 8 in the main event , Scott Doyle having a stellar run in the feature and the 11th place by Ricky Robinson in the ex-Darryl Bonell car AND Darryl being there …. Great to see ya dude! 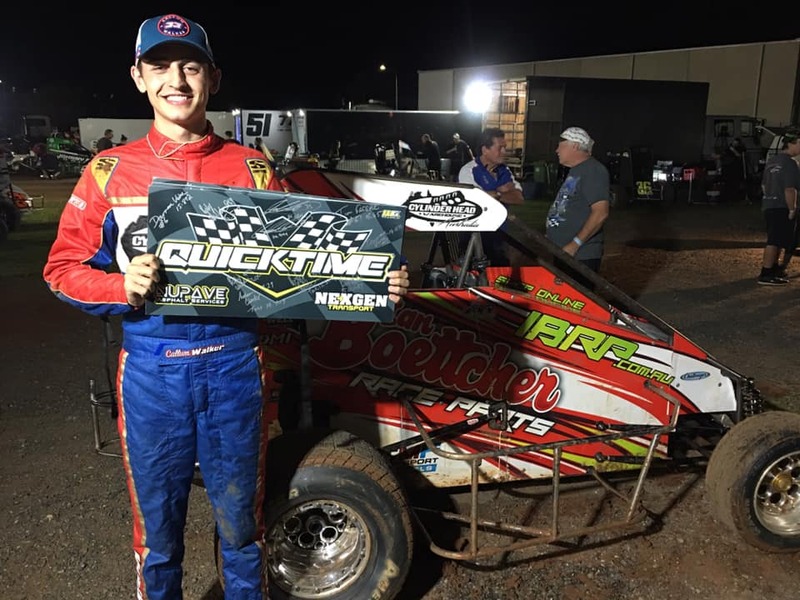 As mentioned also Viney Quick timed in the Nupave NexGen Award and Bradley Harrison picked up the Revolution Race Gear Sunny coast lucky 4th place in the feature ! Our next event on the calendar is our State Title on January 19th in Lismore, The QSRA, Dave Lander and team down there along with Lismore Nissan are running the show and it is set to be a cracker! 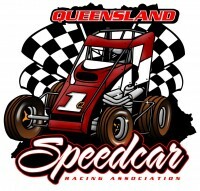 There is no tire ruling for this event and there is a $50 nomination fee payable on the night , ALL nominations need to be into Brock Dean on 0410 195 355 before 6PM Sunday the 13th.